ODESSA, Ukraine -- Ruslan Novikov paused when asked whether he sided with the Ukrainian nationalists or pro-Russia separatists in this co‎untry's fraught debate over national identity. Signs such as "Russians stop maniac Putin!" and "Putin you are drunk. Go home!" 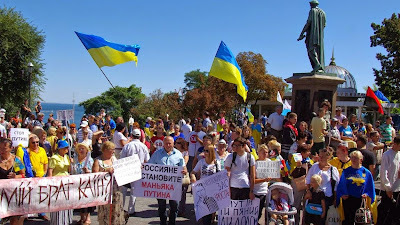 are displayed during a protest against the Russian president in Odessa, Ukraine on Aug. 30, 2014. Novikov, who works as a tour guide, articulates a popular feeling in this seaside town of nearly 1 million. Over the course of the war in eastern Ukraine, this tourist hot spot has sought to remain above the fray. Recently, Nestor Shufrich, a parliament member with the pro-Russia Regions Party, was beaten by about 20 ultranationalists with the Right Sector group as he campaigned for Oct. 26 elections. The group yelled slurs against Russian President Vladimir Putin as they pummeled Shufrich, and the beating was captured in a video that quickly went viral. "I know that if I go to fight, I'm going to be asked to kill other Ukrainians," said Roman Byshliaha, 24. An engineer, Byshliaha has thus far avoided being drafted and dispatched to the front lines thanks to a work deferral. But he knows the government could waive it at any time — a realization he said has had an eye-opening effect. "Politics and fighting always seemed like something that happened somewhere else in the country," he said. Odessa has a rich history of standing apart from the rest of Ukraine. Shortly after the city was built in the late 18th century — its founding ordered by Catherine the Great of Russia — people from all over the region began pouring in, attracted by its emerging port economy and tolerant attitude. Known for years as the "Russian California," the city soon became home to various immigrants: Crimean Tatars, Albanians, ethnic Russians and particularly Jews, who before World War II made up nearly half the population. A literary identity emerged too — writers such as Alexander Pushkin and Isaak Babel spent part of their lives here — and the notion of the Odessan as a sophisticated, sardonic creature distinct from other Ukrainians began to take hold, continuing into the 21st century. Many in the city speak Russian, but with a unique accent. Residents point out that as the crow flies the city is closer to Istanbul, Turkey, than it is to Luhansk, the battleground city in eastern Ukraine. An adage even has it that "around our Odessa you have to build your Ukraine‎." But that exceptionalism began to crumble as tension surfaced. On May 2, demonstrations and counter-demonstrations turned bloody, culminating in a fire at a trade union building near where pro-Russia protesters were camped out. The events claimed the lives of 42 from the pro-Russia side and six nationalists. Though residents believe, and a commission tentatively concluded, that the attacks were instigated by people from outside Odessa, they have aggravated ideological divisions. A makeshift memorial at the site of the fire has turned into a clearinghouse for pro-Russia rhetoric, as Ukrainian nationalist leaders are ridiculed and called "fascists." "I remember being out of the city with some friends on holiday on that day," said a law student who gave his name only as Valentyn because, he said, he'd rather others not know his political views. "And my family rang me up to say what had happened. I thought they must have had the city wrong." Even language, some say, has become a charged issue. For years, Ukrainian was viewed as a tongue spoken by people far from Odessa, usually in villages. But many young Russian speakers in the city have begun taking classes in the national language. Some even have undertaken pledges to speak nothing but Ukrainian for an entire day. The summer and early fall normally see a massive influx of tourists, particularly Russians. But visitors strolling the leafy cobblestoned boulevards near the city's stately opera house or posing for photos at the landmark Potemkin Stairs have been scarce. Experts believe tourism was down as much as 50% this summer. "It's terrible," said vendor Tatiana Chopovaya as she sat amid blinged-out Barbie backpacks. "But I guess that's what happens when there's a war." "We need the myth of Odessa," he said, using the popular term for the city's multicultural reputation. "The more people see us as separate from the rest of Ukraine, the better it is for our businesses." They say, for instance, that sectarian divisions have not developed. The city is still home to 30,000 Jews. And though in May reports surfaced that leaders were exploring plans to evacuate some of them, particularly children — there was concern that the violence would spill over and affect minority groups — that is unlikely to happen. "Yes, it doesn't always feel like Odessa used to feel," said Kapulkin Boleslav, a spokesman for the Jewish community. "People are angry about politics, and there's fear of the far right. But it still is much better than the Soviet period." "I came from Syria six months ago," he said. "So this seems pretty quiet." Ukraine do not need socialism but, Ukraine need to build machines which will billed other machines.